The default location for the installation is the root directory of your hard drive: 'C:\Datagraph-med 5.60. You may change this installation folder, but please make sure, that each user has full read/write permissions to this folder and the folder where your data file will be stored. Datagraph-med requires MS Access to be installed on your PC. MS Access is part of 'MS Office Professional', but not 'MS Office Standard' or 'MS Office Home and Student'. If you don't have Office Professional, you must install Datagraph-med together with the free Runtime version of MS Access. The Runtime version must match your local MS Office version. German and English Runtime versions for Office 2010 and 2013/16 are part of the installation media. More local language versions can be found on the Microsoft website. Important: while both, the 32 and the 64 bit version of MS Windows can be used, only the 32 bit version of MS Office is supported. If you have installed a 64 bit version of MS Office, Datagraph-med can not be installed. You must completely uninstall your 64 Bit Version of MS Office and reinstall the 32 Bit Version, before you can continue. 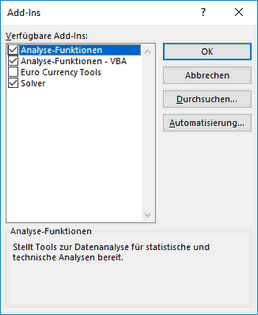 Datagraph-med uses an regression analysis function of MS Excel and some other functions, which will not be available, if you do not have MS Excel installed on your PC. For full functionality, Microsoft Excel is required to be installed on your PC and the analysis functions and the solver add-In must be activated. Datagraph-med is compiled using Microsoft Visual Basic components - these components may differ depending on the service pack version of your MS Office Suite. Please use Microsoft Update regulary and make sure that the latest MS Office service releases are installed before the installation of Datagraph-med.